Voted the best department store in the world, Selfridges has all the latest designer collections, must-have toys & gifts for all the family. It comes just after Harrods for the size and I would say that despite their renown it’s a lot less eccentric than Harrods or even Liberty. But if you are a shoes lover you should be aware that Selfridges is often celebrated for its huge shoes department. Kind of a Carrie Bradshaw’s paradise. And we are talking of both affordable and premium brands. At the end of the sales you can easily find some good bargain. Their sales are sometimes going up to 70% off! Moreover The Wonder Bar in Selfridges has an Enomatic Wine System that allows customers to sample from 52 different wines before purchasing! To sum up, if you are on a budget during your London trip but still wanna experience the posh side of London, you then know even fancy department stores can have good deals and that you don’t need to pay the full price to get drunk! Portobello Road Market is probably the world’s best known street market with a history stretching back over 150 years. It goes through the Notting Hill area carrying everything from farm fresh produce to vintage clothing and accessories. Hundreds of traders sell all sorts of everything, old and new, and there’s plenty of delicious street food from all around the world. Be sure to pop into the hidden gems behind the stalls where you will find endless rows of cafés and antique shops. And don’t forget to stop at 142 Portobello Road where William Thacker’s (Hugh Grant’s) in his shop Travel Book Co. met Julia Robert. It has never been a bookshop but it was Nicholls Antique Arcade, then a furniture store called Gong, and now a gift shop. Note that the market is opened on Good Friday but closes on other bank holidays and for the famous Notting Hill Carnival. Best known for its fabrics, Liberty is the loveliest department store on Regent Street. If you can fight the crowd and reach it you will find a little haven full of precious things. 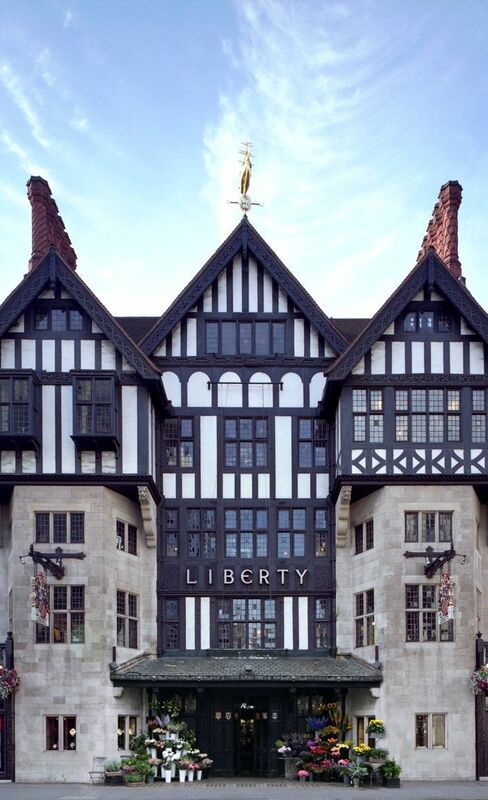 More humble than the shiny Harrods, Liberty is a gem to appreciate for his architecture, inside and outside stunning. Constructed from two ships, Mr Liberty wanted customers to feel as if they were exploring someone’s home, keeping the shopping galleries small, albeit linked to three rather grand atriums. Unlike Harrods Liberty goes from affordable to eccentric prices. You will walk between young creators and well known brands. Go there for the perfume gallery where you will discover exquisite scents. Of course the Christmas period is something magical but one more time, you have to keep in mind that central London gets a bit nutty in that time of the year. Despite the craziness, London is still the best place to feel Christmas, so fight the crowd and go for it! You won’t regret it. 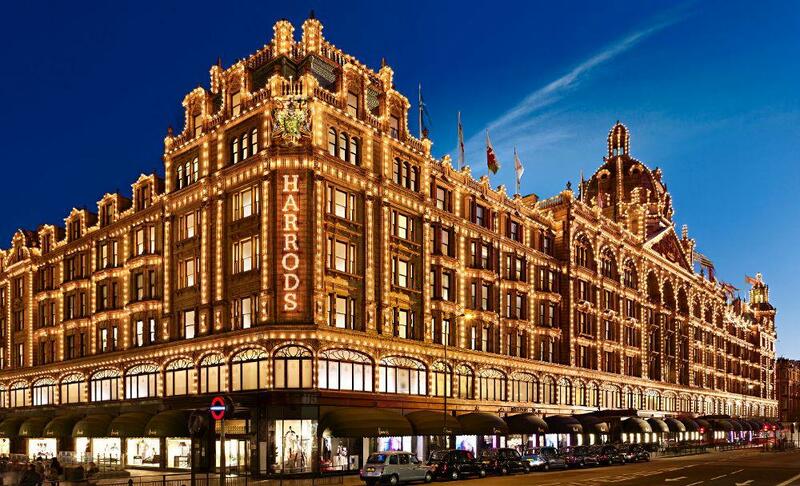 Paris has Les Galeries Lafayette, New York has Bloomingdales, but in London we have the shiny and eternal Harrods! Harrods is sparkling from every corner; from high tea to diamonds you will forever be dazzled by that surrealistic department store. • Harrods was first established in London Stepney Green as a tea merchant and grocery store. • Winnie-the-Pooh was found in Harrods. • An Egyptian cobra once has been hired to guard a £62,000 pair of of haute couture ruby-sapphire-and diamond-encrusted sandals. • A silver replica of Harrods is on display on the store’s lower ground floor. This was a gift from Gordon Selfridge when he lost a bet with the Harrods managing director. • You can buy gold bullion off the shelf. • Noel Coward, writer and playwright bought an alligator in Harrods Pet Shop one Christmas. A baby elephant was also sold by Harrods as a present to Ronald Reagan.